The United States merchant marine refers to the fleet of US civilian-owned merchant ships—operated by either the government or the private sector—that are engaged in commerce or transportation of goods and services in and out of the navigable waters of the United States. The merchant marine is responsible for transporting cargo and passengers during peace time. In time of war, the merchant marine is an auxiliary to the Navy, and can be called upon to deliver troops and supplies for the military. AmericanFlags.com proudly carries the official U.S. 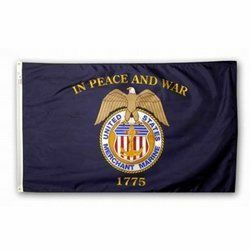 Merchant Marine flag in a variety of popular sizes.